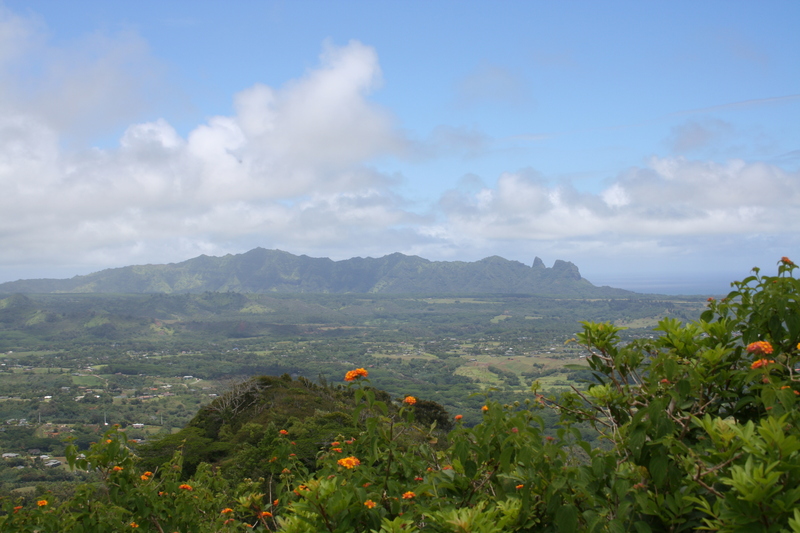 Nounou Mountain aka Sleeping Giant is one of the more popular hikes on the east shore of Kauai for good reasons. 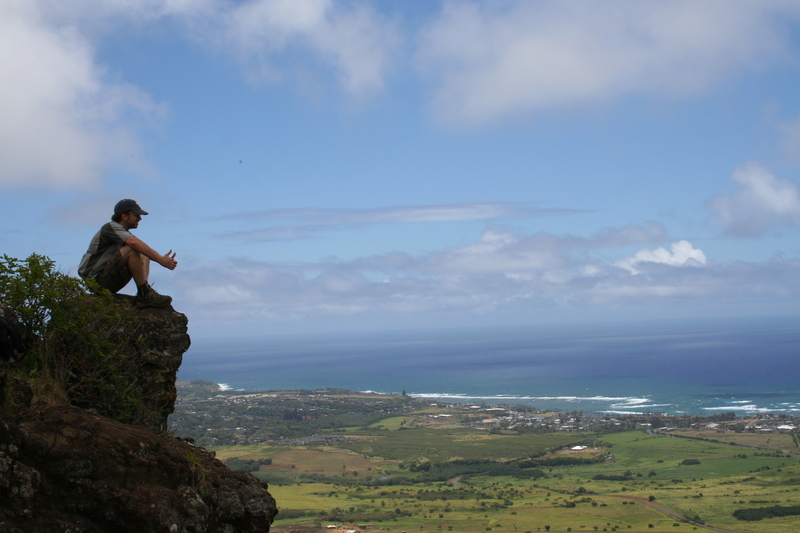 The hike is fairly short, moderately steep and offers a little adventure at the top getting to the giant’s nose and forehead for some top-notch views of the east shore. You can find guided options if you want someone to tell you about the wildlife, plants and views along the route, but the hike is easy enough to do on your own. 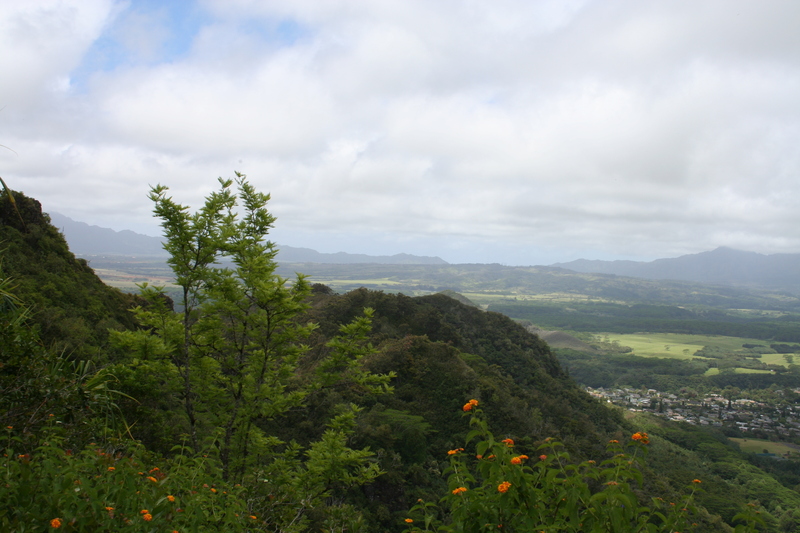 There are three trail options (east, south and west) that converge shortly before the top of the mountain. 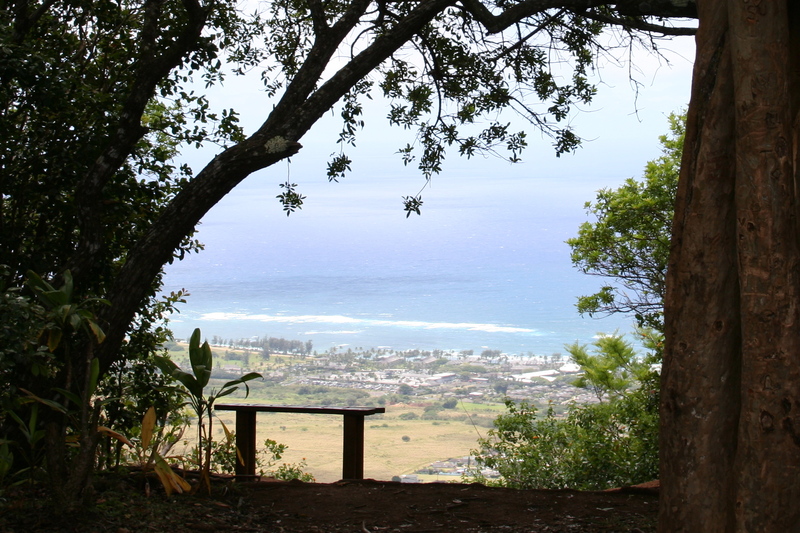 This hike takes you up the east trail, a steady uphill, switchbacked path with viewpoints and an occasional bench. 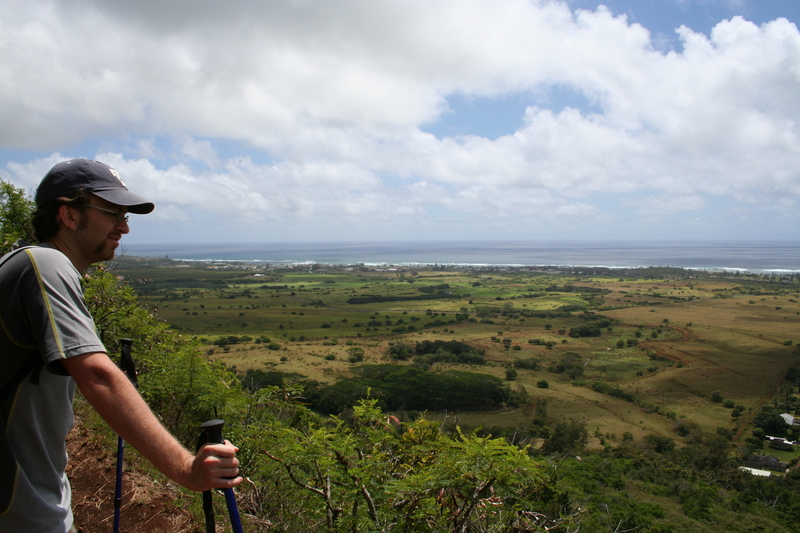 Like virtually every trail in Kauai, this one can be slick when the red dirt is wet, so watch your footing. Due to technical problems, we do not have a GPS track for this hike. GPS Track: Downloadable from user Trainspotting on EveryTrail.com. 1. Park at the eastern trailhead and follow the sign to the Nounou Mountain East Trail at the northeastern corner of the parking area. 2. Follow the trail’s switchbacks up toward the peak visible in the distance. 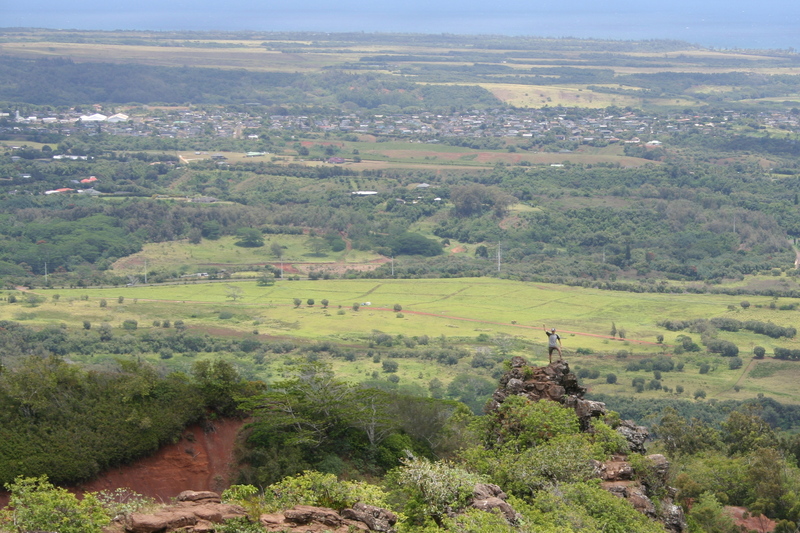 As you get higher you’ll start to see views of Kapa’a, Wailua Bay and more. 3. You will see one more trail sign as you approach the peak. Follow the trail to the left to head up toward the mountaintop. 4. You will come to a grassy plateau with a covered picnic table and a bench just before the last stretch out to the giant’s head and nose. This is a good spot for a lunch or snack break. 5. Continue on the trail across the grassy plateau to head out to the giants head. The trail at at this point gets a little more adventurous, narrowing with drop-offs on either side. It’s not too bad though. 6. 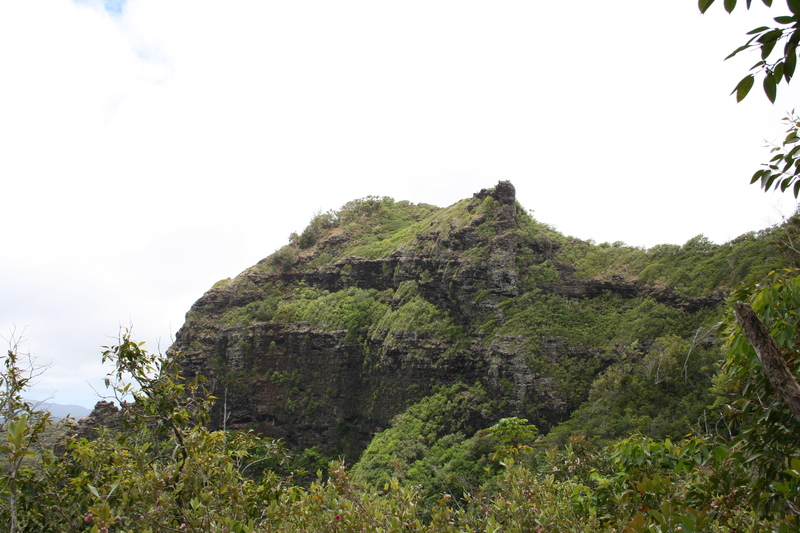 After a brief rock scramble you’ll have the choice to go right toward the giant’s head, a flat-ish area with 360 views [photo] or to the left on a very narrow spine of a trail out to the giant’s nose, a small, windy rocky outcropping [photo]. Most hikers will have no trouble going to the head; for the nose we dropped our packs to make the last part unhindered. Use your own judgment on if you want to proceed to that point. 7. Return the way you came. Standing on the giant’s head. Sleeping Giant from a distance. 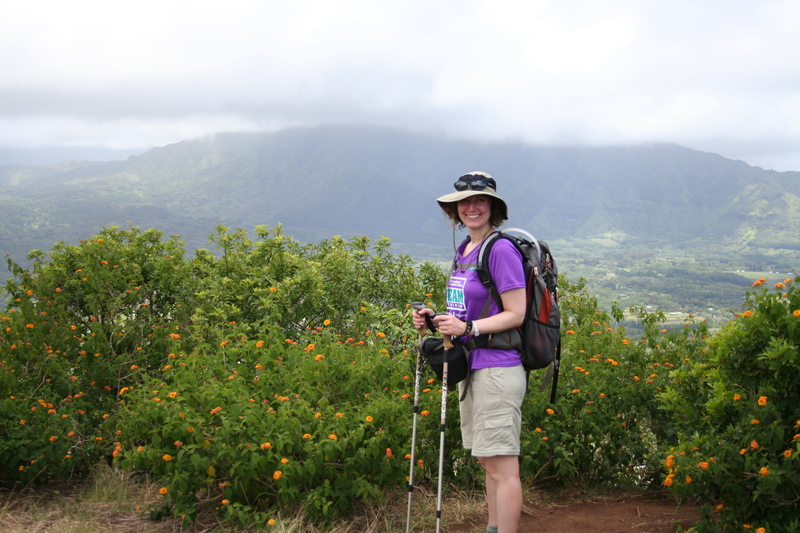 The hike goes steadily uphill on sometimes slippery and rocky red dirt switchbacks. 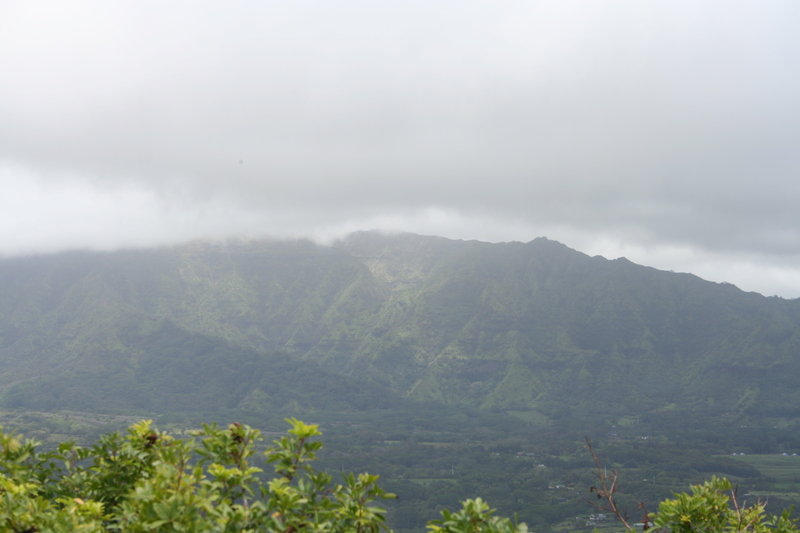 While not nearly as strenuous as the Kalalau Trail by any stretch, there is a risk of slipping and getting a red dirt-stained bum and at 1,200 feet of elevation gain, it’s a good cardio workout. The picnic table under a pavilion near the top of the mountain is a great spot to stop and have a bite to eat. There is a fairly large dirt parking lot at the trailhead making for easy parking.